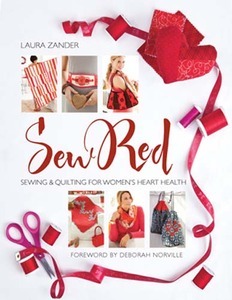 Sewing Red is more than just an inspiring sewing book, it's an appeal to women to take charge of their heart health to prevent heart disease. With dozens of gorgeous fashion, home, and accessory projects, and designers share their own personal experiences with heart disease and tips for keeping your heart fit. 144 Pages. Contributing Designers: Amy Butler, Aneela Hoey, Anna Cohen, Anna Griffin, Anna Maria Horner, Brett Bara, David Butler, Denyse Schmidt, Ellen March, Jenean Morrison, Kaari Meng, Kaffe Fassett, Kay Whitt, Kristen Ashbaugh-Helmreich, Linda Lee, Marcia Harmening, Mark Cesarik, Me and My Sister Designs, Nancy Zieman, Patty Young, Saremy Duffy, Suede, Sweetwater, Tula Pink, Ty Pennington, Valori Wells, and Vanessa Christenson.